Toxic E-waste is growing at a fast rate globally, and you are probably a major contributor. Did you already buy your Christmas E-gadget gift? Make sure to recycle your old one. aNewDomain.net — Toxic e-waste is growing at lightning speed around the globe, and you are probably a major contributor. Did you already do your X-mas shopping? Maybe you purchased some steals from aNewDomain’s hot deals list? That’s alright, no need to fret, but please, please please detox your office, your home, your everything right after you open those shiny new gadgets. By “detox” I mean recycle. I talked about the details of recycling a while back. The majority of consumers still simply throw their old electronics into the trash. They don’t know that many of the materials in their phones are easily recyclable. Take those slightly buggy phones, with their dwindling charge and cracked screens, and recycle them. The average American disposes of a mobile phone every two years. And only one out of ten of these phones are being dismantled and recycled correctly. That means 90 percent of mobile devices in the U.S. are sitting unused or slowly polluting a landfill. Or, much worse, they are dumped on a third world country. The global population is around 6,854,000,000. One can only imagine, then, the magnitude of the danger when 61 percent of the world’s population are mobile users — equaling roughly 4,180,000,000 cell phones. Additionally, most of the mobile users do not use their mobile for more than one year. So that could be roughly 4 billion toxic units a year. So, where do these devices go? Unfortunately, landfills take the majority of the discarded units, which heavily pollutes the ecosystem and wastes materials that could be re-used. 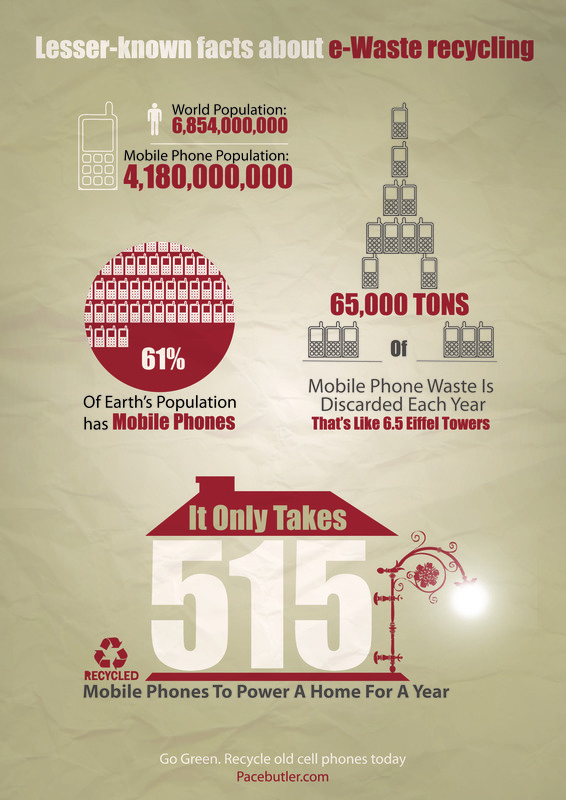 Approximately 65,000 tons of mobile phone devices are discarded every year, from which 6.5 Eiffel Towers can be made! The latest global numbers are scary. When you unwrap that new piece of tech make sure to recycle your now-defunct one. Don’t let it end up in a landfill. Who are these people that just throw valuable gadgets and computers away? I don’t think I’ve ever done that. Old phones and gadgets get sold on ebay, old computers usually get passed along to a friend or relative, or sold on ebay.